On Saturday, July 23, I attended a seminar about vaccination conducted by chiropractor Nimrod Weiner at the Newtown Community Chiropractic centre. Actually, it was a seminar about anti-vaccination. Several of my friends attended as well, and we were criticised by the audience for doing such dreadful things as pointing out errors made by the speaker. I will be writing a full report based on the 80+ PowerPoint slides that we saw, but that will have to wait until I have more time and my blood pressure returns to normal. To give you an idea of what went on, complimentary references were made to people like ex-Dr Rebecca Carley, ex-Dr Wakefield and quackery salesman Joe Mercola. 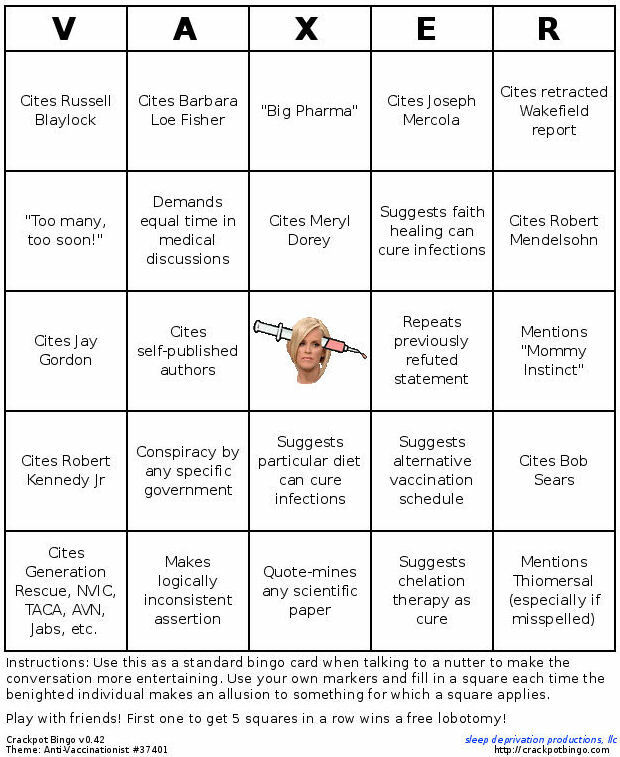 Many of the citations in the slides didn't actually link to anything that could be checked, but even so, Mr Weiner managed to tick a lot of the squares in anti-vax bingo. In July I mentioned that I had risked stroke from hypertension by sitting through a two-hour anti-vaccination seminar presented by chiropractor Nimrod Weiner. I have acquired the PowerPoint slides from the seminar and I am working up a road show in which I show the slides and point out the lies, inaccuracies and misinformation. Unfortunately, telling the truth takes longer than lying so I have to do some rewriting and editing to get the show down to a length where it doesn't drive the audience crazy, but I think it can be done. This week, things turned very nasty for Mr Weiner, who just happens to be Vice President of the NSW Branch of the Chiropractors Association of Australia. The first thing to happen was that Australian Doctor magazine released an audio recording of one of his seminars to a readership who had been somewhat incredulous about reports of what had been said. Australian Doctor does not have an open web site, but you can download the audio recording here (there are several sound files inside a zip file). AUSTRALIA'S health regulator is facing calls to investigate a prominent chiropractor who said vaccines contain "toxic poison". In a public talk, the Sydney chiropractor linked vaccines to asbestos, thalidomide and cigarettes, and said they contained bits of aborted fetus. The chiropractor backed the debunked research of deregistered British doctor Andrew Wakefield - which suggested the measles, mumps and rubella vaccine might cause autism - as "scientifically good". The parents and pregnant women who attended the talk in March were told "homeopathic vaccines" - which are regarded as scientific nonsense by most experts - were safer than conventional vaccines. The comments by Nimrod Weiner, who is vice-president of the Chiropractors Association of Australia (NSW), were recorded by Australian Doctor. They were condemned as "outrageous" yesterday by the Australian Medical Association. In his talk, Mr Weiner said vaccine makers grew germs such as the chicken pox virus "on human fetus, because it's the best medium to grow it on". The nation's chiropractors are on the back foot this morning after being accused of undermining public health policy by not taking a positive stance on childhood immunisation. The Australian Medical Association made the accusation after a prominent Sydney chiropractor told a public meeting that he did not support the science of vaccination. Nimrod Weiner said vaccines contain a variety of toxic ingredients including mercury and human foetus, and believes that homoeopathic vaccines are a healthier alternative. His comments have angered the medical community, which is now calling on Australia's Chiropratic Board to investigate the matter. I'm afraid Professor Booy was far too polite. I sat through one of Mr Weiner's anti-vaccination seminars recently and it was atrocious. I gave a presentation last night in which I went through the PowerPoint for the seminar and pointed out the errors and deceptions. The number of things he got wrong exceeded the number of slides, and what made it worse was that the truth about many of the pieces of misinformation has been pointed out to Mr Weiner and his anti-vaccination ilk on multiple occasions. What is surprising is how quickly the falsehoods can be uncovered, an example being comments about information being withheld from Australian parents despite that information being in brochures from Immunise Australia that are given out freely at hospitals, doctors surgeries and daycare centres. I used to try to be polite to anti-vaccination campaigners. I am rapidly reaching the point where politeness needs to be abandoned because of the danger they present to children's health. I have the feeling that Mr Weiner's regular anti-vaccination seminars could be entering a hiatus while he waits for the heat to die down. Of course, if he wants to do business as usual then I am sure that there will be no shortage of people making his business their business.